There are of course many more you can watch on YouTube. Santa Claus – Defender of Our Doctrine? Does YHWH Like Our X-mess Songs and Holiday Celebrations? Holidays – Each of Us Should Be Fully Convinced in His Own Mind? Pastors: You are lying and you know it! 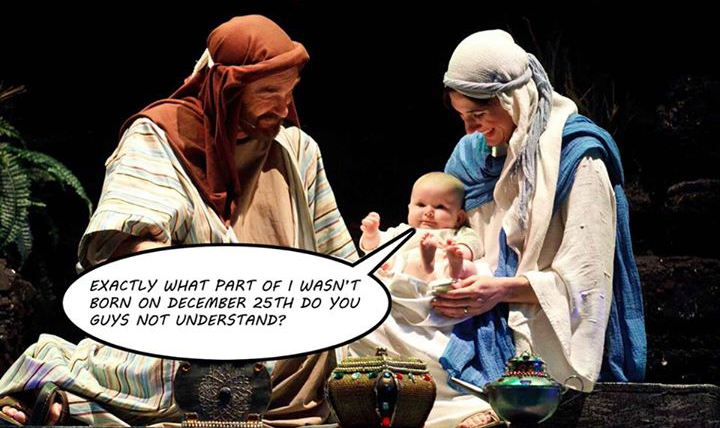 Many of you even openly acknowledge that you know Yeshua was not born on December 25th, but then you go on to preach in front of your X-mess trees and banners that say Happy Birthday to Jesus behind you, while making up excuses for “Christianizing paganism” – a concept found nowhere in Scripture (in fact, a pattern strictly forbidden in the Bible). Ministries: You know this is the best time of the year to raise money with end of the year contributions people can write off on their taxes and so you pull out all the stops. You have big parties and you have super “Holiday Blowout Specials” to sell your stuff – all under the pretense of doing so to celebrate the wondrous joy of our Savior’s birth. It will come back to haunt you though. Parents: If you start out by lying to your kids about Santa and you continue by lying about Yeshua (Jesus), what are you really teaching your kids? Especially, if you try and teach them that “lying is wrong,” what kind of example are you really setting for them? Christian: You know the truth, but you just can’t give up your precious traditions can you? 6b …Thus have ye made the commandment of God of none effect by your tradition. You dispute the above by saying “But God knows my heart…” Yes, indeed he does. 5 And when Aaron saw it, he built an altar before it; and Aaron made proclamation, and said, To morrow is a feast to the Lord [YHWH]. They said that “tomorrow is a feast to YHWH” as they claimed that they were honoring the god that brought them up out of Egypt. Their “heart” was to honor YHWH. But their actions were pagan and had nothing to do with YHWH. Did YHWH respect their heart in this matter? No. Three thousand dead. Look. I enjoyed this season just like everyone else. In fact, X-mess used to be one of my favorite times of the year. I used to write, direct, produce and act in X-mess plays. I was even a mall Santa for crying out loud! 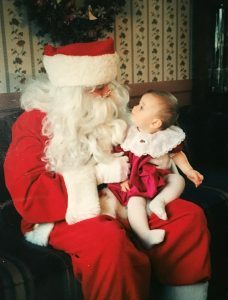 I was my niece’s first Santa. I toured the country with Alvin and the Chipmunks as Santa during the Christmas tour. I love the Christmas songs and all the nostalgia that goes with it. I have many, many fond memories of this time of the year that I once thought was so special. In times past, I believe YHWH may have given us a pass on our ignorance. But we can no longer claim to be ignorant. We now know the truth. Once you know the truth, it should be impossible to go back to the lies. But for many, it’s not. Therefore, it has become willful disobedience. Or shall we just call it what it really is? REBELLION! The truth for many today is, they like it too much to let go of it. Thus, it has become an idol. But consider this: My x-wife’s birthday was in June. My current wife’s birthday is in December. How do you imagine Sheila would feel if I decided to celebrate her birthday in June, because that’s what I was used to for so many years prior to knowing her? What if I said to her, “But you know my heart honey. I’m really thinking of you.” Really? Imagine how your spouse would react to you doing something like that – celebrating their birthday your way. Here’s a little tip: In this scenario, it’s not about YOU. It’s about them! It’s not about how you feel/think. It’s about how they feel/think about the issue. Don’t believe me? Try it out and see. Let us all know in the comments below how it worked out. This is what we’ve done with our Heavenly Spouse! We’ve traded His ways for our ways. We’ve substituted His true holy-days for pagan “holidays” and slapped His name on them. We’ve exchanged truth for lies and done all we can to justify doing so. But it’s not about you. It’s not about me. It’s about HIM! Doing His things, His ways. That is what honors our Heavenly Father. 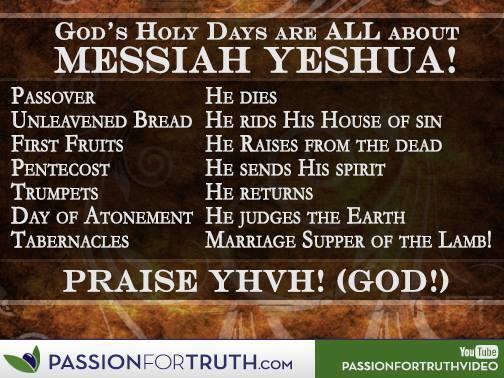 YHWH gave us true holy days to celebrate His ways and activities. Imagine if we got just as excited about doing those as we do with the counterfeits. In addition to doing so on a daily basis, imagine being just as intentional about spreading peace, love and joy (as we attempt to be during the so-called “Christmas season”) during the times and seasons that He has specifically chosen for us to do so. Most importantly: Imagine if we were more intentional about worshiping Him in spirit AND in truth. YHWH said He hated the songs and feasts of Israel’s Northern Kingdom, because they were doing things their way instead of His way. They went into captivity for this. Ephraim (another name for the Northern Kingdom) is only now waking up in the pig-pen and beginning the trek back to the Father. In doing so, we must “turn from our wicked ways” and seek Him and His righteous ways. We must come out of Babylon before judgment falls. Many of you parents began by lying to your kids about Santa. Later you revealed the truth, but how is that setting a good example? Many of you pastors, you are still lying to your congregations though. And ministries, how can you expect to walk in YHWH’s blessings, while keeping one foot in the door of paganism all for the love of money? Why is it that pagans, atheists, agnostics, Wiccans, witches, warlocks and occultists are telling more truth concerning X-mess than you are dear Christian? This should not be the case! I just had a thought regarding ministries. It’s one thing to take advantage of good sales in department stores to get useful items for your home or office, toys and trinkets and the like during a time of the year when they run all the great sales. Why not? Nothing wrong with saving money. However, when it comes to ministries who are also running big sales this time of the year, why not boycott them instead of indulging in their celebration and peddling of lies? You see, department stores never claimed to have the truth that sets men free. Ministries do. But if ministries are mixing truth with lies, is there really any reason to trust that the truth is something they actually care about? Why not send them a message this “holiday season”? Let’s tell them through the withholding of our money that we can’t support any ministry that has exchanged the truth for lies all in the name of profits. That should speak volumes to them I would think. When it comes to holidays, Yeshua’s Father gave us very clear instructions in Deuteronomy 12 and in Leviticus 23. That is the “doing the will of my Father” part Yeshua was referring to in the above passage. Not doing things the Father detests (i.e. pagan things) while slapping His name or the name of His Son on them. In summary: Tis the season to STOP peddling lies and to begin to walk in the truth. Amen! YHVH opened my eyes and heart to the truth of these pagan days early last year. At first, it was hard to give it up because I loved to celebrate these days. Now, I can’t stand the lies and evil being portrayed as good. My children are growing up knowing the truth to the dismay of my entire family. Keep on keeping on Rob! You’re videos, posts, and websites have helped me so much. I have learned more in the past year then I have in the past 14 years. Thank you Rob for your continued efforts to show us how YHWH is leading you of babylon. I have been wandering though babylon for the last 10 years disconnected from Him until he led me to a video of your’s on Youtube a couple of months ago which has really challenged me to return to Him and His Word. I have learned more in 6 weeks of Torah study than in my entire life!! I already feel by meeting Him when He wants and being obedient through loving Him I feel such freedom! I am so looking forward to meeting Him on His appointed times in 2017 and replacing the ‘beast feasts with His feasts’ as you like to say! My wife and I have been blessed to come across your work and following the journey YHWH is taking you on as it has allowed our journey to start and we have awoken in the pig pen, just wanting to return to our Father’s house at long last! May YHWH continue to bless you Rob and continue to light your path, so that you may continue your work in helping others to find their’s. Here, here! Rob, again, a superb job conveying the truth that sets us free! May Yah’s truth spread like wildfire! Shalom! this really has you torqued and that is a good thing! so don’t get frustrated and give up! we may disagree on some things Mr.Skiba and that is fine but the justification of willingly following a lie isn’t one of them keep up your work and be encouraged in Christ Jesus. Thank you so much Rob, you have done me a tremendous service when it comes to strengthening and understanding my faith in YHWH. I am a new born christian with a lot to learn still, I have looked at many many different sources and pastors but somehow I feel your “teachings” is the truth. This is totally off topic but my friend and I stumbled across your work and really enjoy following you on Facebook although for some reason Facebook will not us to make comments on your posts. The topics you discuss have taken our Bible studies to a whole different level and lately we have been discussing the name we should use when referring to our savior. The question is what Bible would you recommend using in order to stay as close to the Greek and Hebrew translations as possible? Keep up the good work you are poviding great fuel for those of us who are looking to broaden or knowledge through Bible study. Oh man, your poor friend. Buy your friend a book and a dictionary and try to stave off the illiteracy! No it’s not. Read Deut. 12 and stop being a pagan.